Even though we’re already several days into 2019, today is really just the beginning, for all of us. And we can prevent the wrong thoughts and beliefs from getting the best of us as we move forward with our lives. We can train our minds to make the very best of the present moment, even when our circumstances are far less than ideal. All it takes is practice. The mind is like a muscle, and just like every muscle in the human body, it needs to be exercised to gain strength. It needs to be trained daily to grow and develop gradually over time. If you haven’t pushed your mind in dozens of little, positive ways over time, of course it’ll crumble on the day things get overwhelmingly stressful. The best way to start training your mind? Affirmations. They are one of the simplest and most powerful tools for staying on track in life. A mind well trained with the right affirmations has the right thoughts queued up and ready for retrieval at a moment’s notice. One of our course students, who graduated with a PhD a couple years ago from one of the most prestigious universities in our country, is now an executive for one of the world’s fastest growing tech companies. Throughout grade school and high school she desperately wrestled with a form of dyslexia that made reading and writing a monumental challenge. She spent kindergarten through 12th grade in language-based ESE classes. And during a parent-teacher conference when she was in 10th grade, one of her ESE teachers informed her parents that it was extremely unlikely she would ever receive a high school diploma. Marc and I would love to hear from YOU! Which affirmation mentioned above resonates with you the most right now, and why? Also, if you haven’t done so already, be sure to sign-up for our free newsletter to receive new articles like this in your inbox each week in 2019. Great one, Marc and Angel! Happy 2019! I absolutely love how your affirmation #1 slapped me upside the head and your affirmation #2 grounded me to a powerful truth I so often forget. Thank you for your emails, book, and other teachings. What you two share continuously helps me grow! M&A, number 14 above is something I once struggled with to no end. I actually found your blog about two years ago when I was completely burnt out. Between work, family and friendship obligations, my tank was completely dry. In a nutshell, I was stretching myself way too thin — I was giving all of myself to the people I care about and leaving no time to nurture my own needs. After reading your articles and emails, I signed up for your course and got on a coaching call with you. The rituals we designed for dealing with my self-neglect and balancing my time so that I’m now nurturing both myself AND others, has been a life-saver. Angel, I love the positive affirmations you’ve shared here and I will start using them today. But I wanted to leave you a note here to let you know how much I deeply connected with the way you ended this post…the challenge to question our stories and self-talk. Too often I am guilty of avoiding the situations, experiences and relationships in my life that aren’t “perfect” or ideal. I talk down on myself and my various life situations. I need to start reflecting on the stories and default (discouraging) things I tell myself. 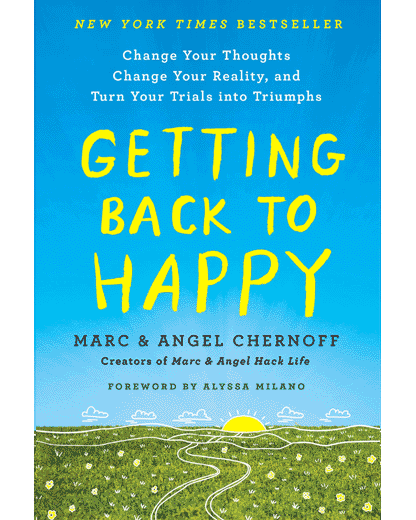 Anyhow, as Laura mentioned above, I’ve been a long-time reader of your site, and my wife and I sit down together every week and use your posts, emails and excerpts from your Getting Back to Happy book to reflect on our lives. This post has helped us do just that today as we begin anew for 2019. Happy New Year to you and Marc. Thank you for this helpful post! I’ve always thought that ignoring negativity does more harm. It’ll just come back later to haunt you again and again by not dealing with it. Whatever negative thoughts or self-talk that pop up in our heads, we need to counter them with positive thoughts and bring balance! I love this….as well as your book. Thanks for making me a bit more thoughtful about how I live my life. Overcome the mind, I can overcome anything, control thoughts. In my response, I control everything. Accept everything, meet it with the best I have to give. Focus gratitude, stop focusing on how stressed I am, remember how blessed I am. Be positive, overcome the negative. Be present, what is, right now. Get back up. Again, and again. The faster I recover from setbacks, the faster I’ll get to where I’m going in life. Be Patient genuine expression of confidence, acceptance, serenity, and faith in my own ability. It’s a sign of strength. I will practice it. Find time, for what matters. Rise above, petty drama and distractions. Substitute…angry, find the lesson. …envy, feel admiration. …worry, with positive action. …doubt, have faith. Enrich my own life, it will be life-giving to others. Water the grass I’m standing on. When the grass looks greener on the other side. Humbly substitute making myself better, on thinking I am better. Practice Gratitude and Happiness, Now. Make the best of what I have. Accept it for the Gift it is and Remember finding Happiness is the only job we are born with. Thank u for always sending “words of wisdom” wishing u both a very healthy and peaceful new year! Thank you for all your helpful insight in your emails, books, etc. I love reading your blogs about overcoming obstacles and maintaining a positive, strong mindset. It has helped me so much in 2018 and I’m looking forward to bettering myself from it even more in 2019. Thank you! Happy 2019 and love you both. Thank you for your wonderful insightful suggestions and guidance through your newsletters. They are thought provoking and life changing for you to be in a better/positive/happier place, mentally. With very best wishes for the future and am looking foward to this years advice & tips.